July 2, 2013: Paramilitary troops from Senegal’s rapid intervention force surprised exiled former Chadian dictator Hissène Habré in his plush Dakar villa Sunday morning, charging him today with crimes against humanity, war crimes and torture. The cunning and charismatic former Chadian president, who seized power in a June 1982 coup and ruled with an iron fist until his own overthrow in December 1990, has lived openly and with impunity in Dakar for 22 years. He will now be remanded to Dakar’s Cate Manuel jail, a 50-person lockup Senegalese government workers have been quietly refurbishing over the past several months in preparation. There he will await trial in a special court, scheduled to begin within two years. The arrest is the culmination, to date, of a nearly 15-year quest by Chadian accusers and an international legal team led by a quietly obsessive American human rights lawyer named Reed Brody. The arrest comes just days after President Obama hailed Senegal’s efforts to prosecute Habré during a meeting in Dakar with Senegalese President Macky Sall, and the US State Department has pledged $1 million towards the cost of the trial, a decision tied to the creation of Mr. Obama’s year-old Atrocities Prevention Board. But the recent American support contrasts significantly from the United States government’s response the last time Hissène Habré’s fate hung in the balance – in December 1990, when the Central Intelligence Agency and State Department’s Africa Bureau loaded C-141 cargo planes with weapons in a crash effort to save the dictator the CIA had helped to power, armed to the teeth and dubbed “the quintessential desert warrior” for his eight-year collaboration in US President Ronald Reagan’s covert effort to destabilize Qaddafi’s Libya. The case of the obscure Chadian dictator marks a profound, if little known, cautionary tale about American intervention – and a breakthrough in the landscape of international justice. The case against Hissène Habré began not with the Senegalese rapid reaction force this week, but a Friday night in London nearly 15 years ago when agents from Scotland Yard slipped into the London Bridge Hospital, an advanced private surgical facility on the south bank of the Thames, and arrested Gen. Augusto José Ramón Pinochet Ugarte, the then-82-year-old former dictator and 30th president of Chile, who had just undergone back surgery. It was the first-ever arrest in Britain of a former head of state traveling on a diplomatic passport, and it set off a storm. When Pinochet’s appeal against extradition for trial in Spain was heard months later in the gilded Chamber of the House of Lords – he was charged with 94 counts of torture, the assassination of a Spanish diplomat and one count of conspiracy – there was a young American human rights lawyer sitting on the edge of his seat. Reed Brody had represented Human Rights Watch as a party to the case, and knew it could forever change the scope of human rights law. The ruling of the Law Lords, as they are called, allowed for Pinochet's extradition. Cheers erupted in the courtroom and in the courtyard outside. The Pinochet case would continue, but the stakes were clear. “Henceforth, all former heads of government are potentially at risk,” said then Prime Minister Margaret Thatcher, expressing her shock at seeing Pinochet stripped of his immunity. “This is the Pandora's box which has been opened – and unless Senator Pinochet returns safely to Chile, there will be no hope of closing it." That’s, in fact, just what Reed Brody was thinking. Brody had helped write the United Nations Torture Convention upon which the Pinochet verdict hinged. Now he needed a case to build on “the Pinochet Precedent” – not a hard case, like Saddam or Qaddafi, but a case he could win. “How about Hissène Habré?” said a colleague, referring to the former Chadian dictator, who had been living in gilded exile in Dakar since his overthrow in December 1990. Brody had barely heard of him then – few Americans had. An exception were veterans of the Reagan-era CIA and the State Department Political-Military Bureau, to whom Habré was the tip of the spear in the Reagan Administration’s first, and perhaps bloodiest, covert action. “I became known as ‘Charlie Chad,’” said veteran US national security and intelligence operative Charlie Duelfer, describing one of his first assignments in a long career in government service, most recently as head of the CIA’s Iraq Survey Group investigating Iraq’s WMD programs. In the early ‘80s, the ginger-haired, ginger-mustachioed 30-something was a fresh-faced civil service officer at the State Department’s Political-Military Bureau – “a little Pentagon and CIA at State,” as Duelfer described it – with a taste for adventure, good contacts at Langley, open for anything that would get him out of the office. In fact, N'Djamena is the Chadian capital, to which Duelfer would accompany several plane-loads of arms shipments. 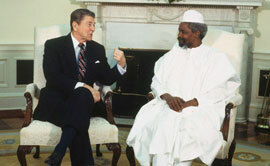 Reagan was looking for an easy win against the scourge of international terrorism, and Chad offered an opportunity. The world’s arch terrorist, Muammar Qaddafi, had thousands of troops camped out in the remote desert of Northern Chad, a forward front in his pan-African expansionist plan, but a thousand miles from Tripoli on tenuous supply lines and thus highly vulnerable. In a visit to Habré’s rebel camp on Chad’s border with Sudan, where the rebel leader was readying his troops to take the presidency by force, the CIA’s station chief in Khartoum won assurances that in exchange for the CIA’s assistance, Habré would be more than willing to support the Reagan Administration’s effort to “bloody Qaddafi’s nose” and “increase the flow of pine boxes back to Libya," as then Secretary of State Alexander Haig put it. 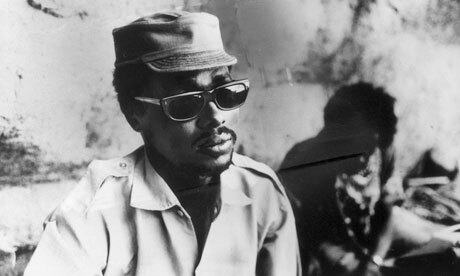 Covert shipments of weapons and cash began flowing, and Habré took the Presidential Palace. Soon, the proxy war against Qaddafi was underway, and “Charlie Chad” and his CIA counterpart were there, ferrying Habré C141 Starlifters full of weapons, eventually including a dozen Stinger missiles, the coveted and deadly shoulder-fired anti-aircraft weapon system lusted after by terrorists and aspirant armies worldwide. The CIA also established a secret camp a few miles outside the Chadian capital where it trained a “fifth column” of anti-Qaddafi Libyan fighters – the Libyan National Salvation Front (LNSF) – comprising some two hundred men with Warsaw Pact arms, including Soviet-made main battle tanks. It was a huge success: Over the next eight years, Habré’s forces killed some 10 thousand uniformed Libyan troops – often from the backs of nimble CIA-purchased Toyota Hilux 4x4s - a success that won Habré an invitation to the White House. It was during the same eight years Habré was armed and supported by the US government, however, that he and his forces are accused of having disappeared, tortured, starved to death and/or executed some tens of thousands of Chadians. “This regime was completely inhuman – they were worse than animals,” recalled Souleymane Guengueng, a former bookkeeper who was held on the flimsiest of political charges in three secret jails over nearly three years – first in solitary confinement, then packed so tightly with other prisoners they couldn’t lay down to sleep; alternately in total darkness or blazing electric light, 24-hours-a-day for months on end, which would leave him nearly blind. He’d be hung from his testicles after being caught leading prayers for other prisoners, and suffer from malaria, pulmonary edema and hepatitis, losing the ability to walk for months. Guengueng survived, regaining enough strength to stagger onto the streets with thousands of other prisoners in December 1990, when a new set of rebels, led by Chad’s current president, Idriss Déby, ousted Habré and flung open the jails. Habré escaped, eventually to Senegal, with some $12 million pilfered from national bank accounts, which he reportedly put towards the purchase of two mansions and, it is widely believed, enough Senegalese newspaper editors, police officials, religious leaders and politicians to keep the heat off for years to come. Guengueng, meanwhile, spent the next months quietly collecting testimonies of fellow prison survivors, fulfilling a pact he had made with God one unbearable night in prison: That if he was spared, he would dedicate his life to telling the truth about what Hissène Habré had made of Chad. He would eventually hide some 700 testimonies in the back of his house, threatened with death by Habré’s henchmen, who remain in Chad, many still in power to date. It would take an ambitious American lawyer to help Guengueng fulfill his pledge, turning those testimonies, years later, into the core of a groundbreaking legal effort by Chadian victims and Chadian and international attorneys to hold Habré to account. Habré's victims gather in N'Djamena in October 2012 to offer testimony to Brody's legal team. Traveling with Guengueng and other Chadian victims, Brody and his team filed the first criminal complaint against Habré in Dakar in January 2000. “The Habré case was instant gratification at the very beginning,” Brody recalled, laughing. The case made international headlines and Habré, who had lived openly with impunity in Dakar, was called in for questioning. Human Rights Watch put out a press release anticipating a trial within a year. The “quintessential desert warrior” would fight tenaciously on the legal front, and members of Brody’s team were targeted: The case’s lead Chadian lawyer, Jacqueline Moudeina, was seriously injured in a grenade attack in N'Djamena orchestrated by Habré supporters. But the more powerful impediments came in the form of chronic dissembling from African and international leaders, many of whom, including powerful members of the George W. Bush Administration, felt sensitive to having their records called into question in an international court and thus impeded the prosecution. Disappointment after disappointment in the case led Brody to some of the lowest points in his life, he admits – he sacrificed his marriage and several job opportunities over the years. But now, as the case finally heads for trial, he considers his own hardships slight compared to what his Chadian partners have borne, and highly worth the wait. For Brody, however, the wheels of international justice are turning irrevocably. Michael Bronner is a founding editor at Warscapes. Watch the site for his in-depth series on the Habré case and the US government's secret courtship of the dictator in the Reagan-era covert action against Muammar Qaddafi. Research assistance for this piece was provided by the Investigative Fund of the Nation Institute.